I’ve been to enough CicLAvia’s to know that while each one is special, there are universal truths to each one of the them. For some reason, I’m not smart enough to always remember them. Come out Sunday and make sure to check off everyone of these. Then repeat. Mister. On a hot day like Sunday, having one of these will make you more popular than having a puppy outside a yoga studio. Never fails. Bring a speaker. You can bring your own headphones(remember, you’re only supposed to use one ear), but there’s nothing better than having your own ambient soundtrack. 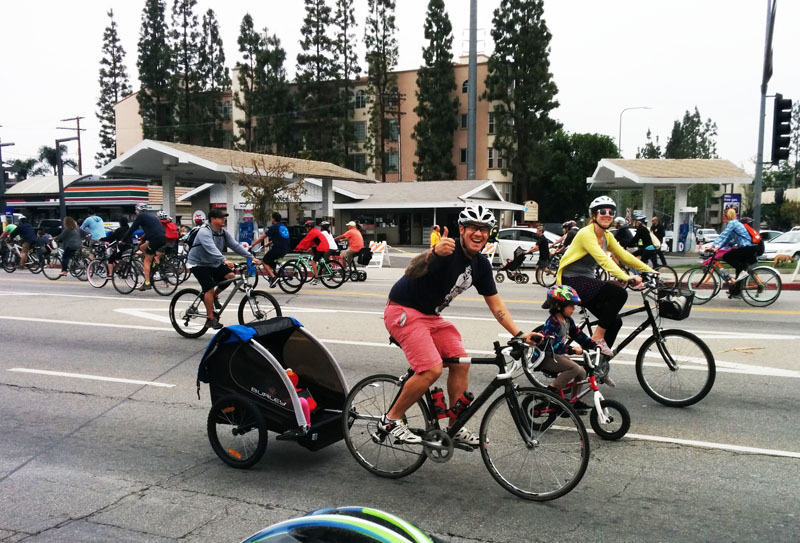 CicLAvia is already a unique experience, but having your own sound gives you more ownership. I got this from Target and I can’t stop riding without it. Read up. Every neighborhood always carries an interesting historical background, but it’s a bit hard to do your research on the fly. CicLAvia, Militant Angeleno(I still think he’s Chuck Henry) and Streetsblog LA always do excellent work that will make you feel like a Jeopardy Champion with all that knowledge at your hand. Leave your clipins at home. I probably spend three-quarters of my time on a bike in lycra, but CicLAvia is not one of those days. 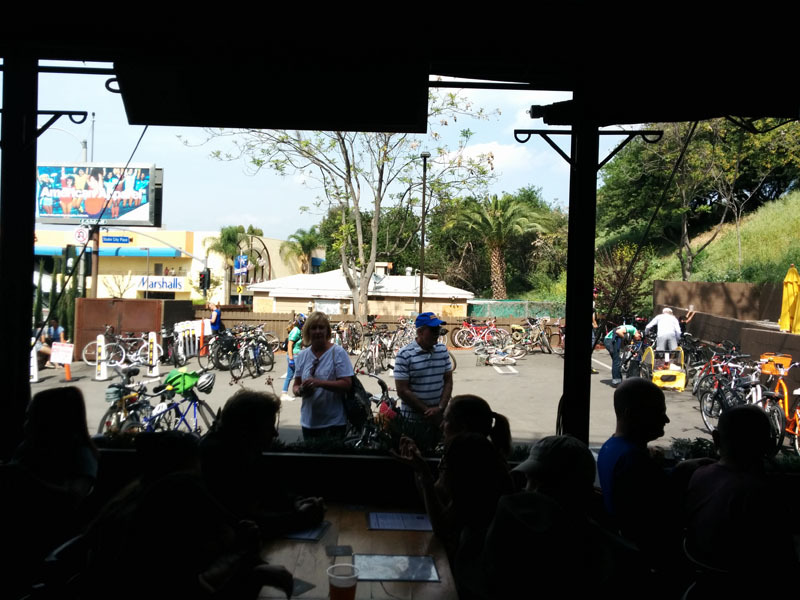 Even in the least crowded portions, you’ll be forced off you bike at some point. I fell over in Chinatown getting slightly bumped in the middle of an intersection while wearing my racing pedals. Lesson learned. Give yourself plenty of time. Yes it’s short, but you’ll probably spend most of the event off the bike. 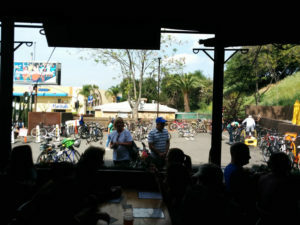 Most of the restaurants and bars will be crowded to the point that you’ll feel like you’re at a German Biergarten during Oktoberfest. Who can complain about that? Dress up. 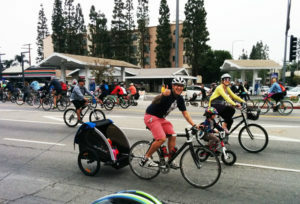 CicLAvia is part festival, so take this opportunity to give it some flair. Find a costume. Dress up your bike. Finish off that facial tattoo(Mike Tyson only). Sunscreen. Many people forget, but if you’re a southern californian, this should be automatic. I’ll be wearing my CiclaValley shirt if you’re in dire need. If you haven’t figured it out by now, a backpack! Get involved. There will be a number of great cycling organizations, as well as community groups at the hubs that are worthy of your support. Interact with businesses. Merchants are allowed to extend onto the sidewalk, so let them know you’re happy to see them support CicLAvia. Lastly, don’t forget to bring your smile. If you forget it, don’t worry. It’ll be easy to find on Sunday.